On Monday 28 April Etihad Airways unveiled three huge, 9.5metre-long Boeing 787 Dreamliner aircrafts at London Heathrow’s Terminal 4. The eye-catching structure, in full Etihad Airways livery, and each weighing 1.4 tonnes, with a wing span of 10 metres, will be seen by more than 6.6 million people every year as they drive past the roundabout. 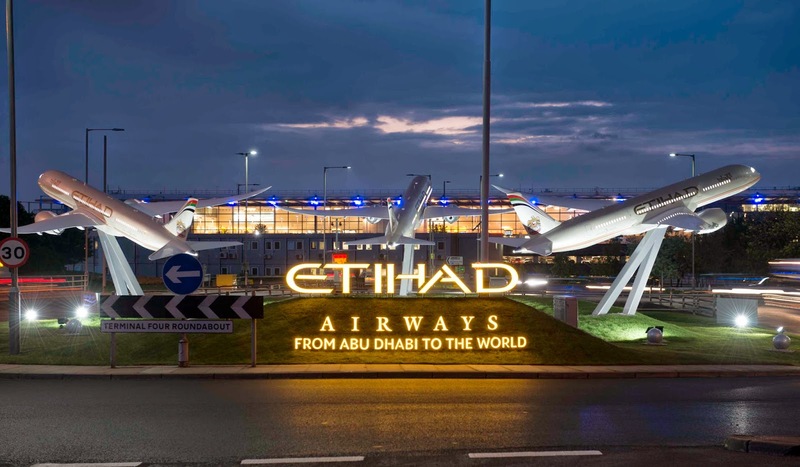 Etihad Airways currently operates three daily flights from London Heathrow to Abu Dhabi, as well as a twice daily service from Manchester to Abu Dhabi, where passengers can connect to its network of destinations in Africa, the Middle East and Asia.